Does your acupuncture technique hurt? No. My technique is gentler, subtler and less painful than the Chinese techniques which most acupuncturists in North America use. I use thinner needles and employ shallower insertions than Chinese acupuncture. This means that discomfort is rarely experienced during treatment and if there is discomfort, it is very minimal. Does your shiatsu technique hurt? No. My technique is not aggressive at all. 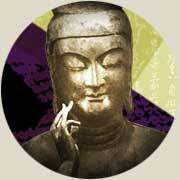 Shiatsu treatments are generally relaxing as a deep but gentle pressure is normally used. The intensity of pressure applied is adjusted according to your condition in order to minimize discomfort. Certain areas of your body, however, may feel tender during or following the treatment. Does your moxibustion technique hurt? A bit. If I use indirect moxibustion, it does not hurt at all. You will only feel a comfortable heat. With direct moxibustion, you'll feel an intense, localized heat for a second or two and you might get a blister with a minor burn (less than 2mm in diameter). Having said that, direct moxibustion is much more effective than indirect because of the longer lasting acupuncture point stimulation due to blistering. 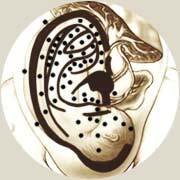 Blistering elicits the body's healing process and with direct moxibustion, the body's self-healing power is focused on a selected acupuncture point (and its associated area) for an extended period of time. Can I get AIDS or hepatitis from your needles? No. I only use disposable insertion needles. Each needle comes packaged and pre-sterilized with ethylene oxide gas. New needles are used with each visit and are disposed of immediately following each treatment into a biohazard-marked container. I follow universal precautions to protect my patients and myself. Acupuncture has no adverse effects or risks. Is acupuncture's effectiveness just a placebo effect? No. Acupuncture has been widely used to treat a variety of domestic animals. In Japan, it is regularly used with success to treat racehorses. These animals are immune to the placebo effect and to the psychosomatic element of therapy. This means that it is the insertion of needles into specific points, itself, that works. Any form of medicine has a placebo component, including modern medicine. The placebo effect is just a small part of acupuncture's effectiveness. While a positive attitude may enhance it, a negative attitude will not block the effects of acupuncture. Yes. The best use of acupuncture is for the maintenance of health. Oriental medicine says that the best doctor cures illness before it occurs, which means that prevention is the most important thing in medicine. A principle in Oriental medicine is that changes in ki (Qi) or energy, precede physical change. This means that acupuncture can act as preventive medicine, correcting the balance of energy flow before a serious illness occurs. It is accepted that automobiles need regular maintenance to keep them running reliably yet we tend to ignore our own body's call for attention. This is very strange when you consider how easily a worn-out or broken part on a car can be replaced compared to a dysfunctional part of one's body. We must start to value ourselves more than our automobiles and work towards the maintenance of health and the prevention of disease. Can I lose weight through your treatments? It is almost impossible to lose significant amounts of weight through acupuncture or shiatsu treatments alone. Appropriate diet and exercise modifications must also be made. That being said, acupuncture and shiatsu strengthens the digestive system and helps to increase the metabolism -- two benefits which are very important for healthy weight loss and weight maintenance. Regular treatment also releases joint and muscle tension and corrects structural imbalances. This allows you to continue weight-loss activities without pain or injury. Patients who come regularly for treatment seem to be able to maintain their body weight without effort. There may be a redistribution of body fat and muscle tone as the normalizing effects of acupuncture and shiatsu work in the body and this might be perceived as weight loss. There may also actually be a slight loss of weight over time with regular treatment. Even if weight loss is not a concern for you, proper diet and exercise is important to health and will greatly increase the health maintenance benefits of regular acupuncture and shiatsu treatments. Will acupuncture help with my cigarette or drug addiction? Acupuncture may change your taste for cigarettes and you may start to dislike smoking but the final steps in quitting are dependent on your will. Your own will is most important and acupuncture will help support it. Similarly, acupuncture does not cure drug addiction but it does alleviate withdrawal symptoms so that mental and physical stability are achieved as soon as possible. For more information, please contact the National Acupuncture Detox Association (NADA) at NADAclear@aol.com or (503) 222-1362. I do not take patients whose primary goal is to quit smoking or break a drug addiction. No. Acupuncture should not be regarded as a cure for cancer. I have heard people say that acupuncture cured their cancer. While I am happy for them and respect their perspective, I am not sure that it was acupuncture alone that brought such healing. Was a misdiagnosis involved or did somehow the body and mind fight back without the help of modern medicine? Oriental medicine believes that if a physical change has already occurred, it can be reversed by adjusting the flow of Ki (Qi). This means that there is always a way of treating any type of illness by correcting imbalance and strengthening the body's self-healing power. The transformative power of the body on the mind and vice versa is very profound and mysterious. Acupuncture and shiatsu are great for relieving some uncomfortable symptoms and reducing some pain of serious illness. They can also play an important role in recovery and rehabilitation by restoring balance of structure and function in the body. Above all, acupuncture and shiatsu are excellent preventive medicine for they can correct energy flow before serious illness occurs. I have had acupuncture before. Is it all the same? No. My techniques are Japanese and most acupuncturists in North America use Chinese acupuncture techniques. All acupuncture is different. There are variations in approach even within Japanese acupuncture techniques. If you have tried acupuncture before and a) it didn't achieve the results you were hoping for or b) you didn't like it, I would still recommend that you try my treatment. Likewise, if my treatment doesn't work for you, it doesn't mean that another acupuncturist's approach won't be successful. If you have had many treatments with several different acupuncturists and your problem continues, you may want to try a different treatment modality. It would also be prudent to consult a physician (preferably a specialist) to make sure there is no serious illness behind your complaint. 70% of my clients are English speakers. 70% of my clients are female. The largest age group of my clients is the 30 to 40 years of age category. My eldest client has been a 99 year old Japanese woman. 1) back pain; 2) neck and shoulder pain; 3) other joint problems; 4) menstrual disorders and 5) emotional disorders. How do you select acupuncture points? The accurate selection of acupuncture points requires that knowledge of the general anatomical location of points be matched by experience and sensitivity in the fingertips. Mr. Sorei Yanagia, the most renowned acupuncturist in modern Japan and the first principal of my Acupuncture College wrote in his book The Complete Book of Acupuncture and Moxibustion Medicine, "When performing acupuncture and moxibustion for disease prevention and treatment, one must, at any cost, be very strict in selecting acupoints...Is the purpose of acupuncture merely for stimulation? No, we do not think this way. While stimulation of the living body makes one metal needle or one pinch of moxa effective, we believe that it is the accurate selection of acupuncture points that contribute most to their effectiveness." 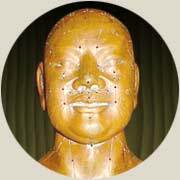 There are three different types of acupuncture points I choose for treatment. The first types are local points chosen for their effectiveness in providing symptomatic relief. To locate their exact position, I usually palpate for tension, pressure pain, heat and/or indurations. The second types are distant points chosen to address energetic and structural imbalances in the patient. To locate these points, I usually feel for a subtle depression or indentation in the tissues. The third types are special effect points: standard acupuncture points for specific problems and for strengthening the body's self-healing power. They may or may not be easily palpable, but their effectiveness has been empirically proven throughout history. 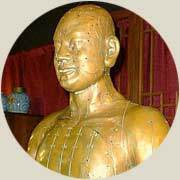 This figure is a copy of one designed by the physician Wang Weiyi in 1027 AD to train doctors in the practice of acupuncture. The figure is hollow and has 354 holes to represent acupunture points. When students took their exams, the figure was covered with wax and filled with water. A student had to insert a needle into a precisely defined acupuncture point. If they were successful, water would flow out. Should I come before or after a sporting event? Professional athletes receive treatment both before and after their activity. Treatment techniques vary depending on the relative timing of the event. If you can come only once, I'd recommend that you come before your sporting event. There is truth to the expression, "an ounce of prevention is worth a pound of cure". You can avoid or lessen the chance of injury and you will be in better condition to achieve a better performance. Because treatment techniques and intentions are different depending on the timing of your event, it is important that you tell me when it is (or was). I graduated from Toyoshinkyu College of Oriental Medicine in Tokyo, Japan in 1988. My school is the most renowned school in Japan for teaching traditional acupuncture techniques. Most of my instructors had 30 to 50 years of clinical experience. This three-year, 2800-hour comprehensive program gave me a solid grounding in Western health sciences and Oriental medicine theory as well as strictly supervised training. While studying full time, I gained further practical experience in soft tissue disorders by working at a sports clinic in Tokyo, 30 hours a week for two years. I take continuing education courses regularly to improve my technique and I share clinical experience with my colleagues on a daily basis. Above all, the greatest wealth of information, experience and wisdom comes from the people I treat daily. This offers me the most valuable learning process of all. Yes. Our clinic is by appointment only. Treatment times are usually filled one week in advance, so you are best to book ahead for a time that suits your schedule. Occasionally there are cancellations and you may get in with shorter notice if you are flexible. Appointments are made by telephone only. Our phone number is (604) 737-1016.